Morgan and her mom made these incredible spring rolls the other night for company, and they were a huge hit. I thought they were every bit as good as any I have had at a restaurant. Fact is, this is a restaurant recipe, from la Patisserie in Birmingham, Alabama, where a large Vietnamese population has resettled after the floods in New Orleans. There is a wonderful video that accompanies this recipe, for which I will post the link at the end of this recipe. Try these. You will need to find a good Asian market to get the rice wrappers, but if you haven’t found one already, you owe it to yourself to find one. Now. The one near us is wonderful, and always smells great. Very nice people, too. Whisk vinegar, fish sauce, sugar, lime juice, garlic, and red pepper flakes together in a small bowl. Set the dipping sauce aside. Fill a large bowl with room temperature water. Add rice vermicelli and soak for 1 hour. Bring a large pot of water to a boil. Drop in shrimp and cook until curled and pink, about 1 minute. Remove the shrimp and drain. Or you can buy precooked baby shrimp with the tails on. Defrost and pinch off the tails. Transfer rice vermicelli noodles to the pot of boiling water and cook for 1 minute. Remove and drain in a colander. Immediately rinse the vermicelli with cold water, stirring to separate the noodles. To assemble the rolls, dip 1 rice wrapper in a large bowl of room temperature water for a few seconds to soften. 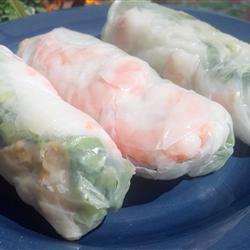 Place wrapper on a work surface and top with 4 shrimp halves, 1/4 of the chopped lettuce, 1/2 ounce vermicelli, and 1/4 each of the mint, cilantro, and Thai basil. Fold right and left edges of the wrapper over the ends of the filling and roll up the spring roll. Repeat with remaining wrappers and ingredients. 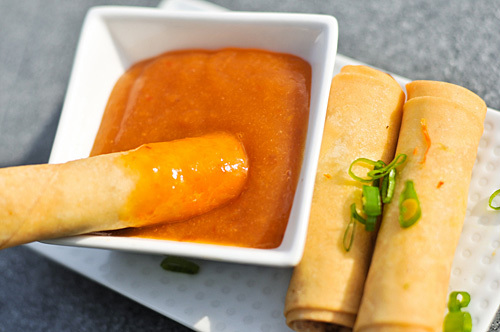 Cut each roll in half and serve with dipping sauce. 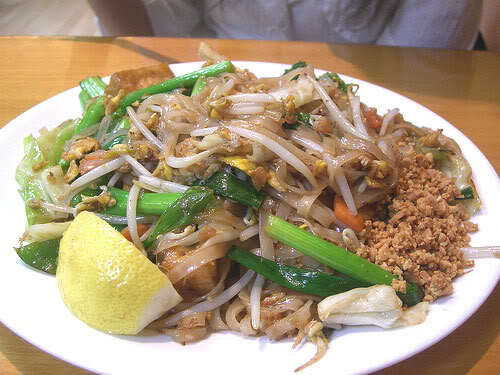 Here is a vegetarian version of Pad Thai. It is wonderful, slightly different, and tasty nonetheless. 1. Place noodles in a large bowl and cover with hot water; let stand until noodles are soft, about 20 minutes. Drain, rinse with cold water, and drain again. 2. Heat oil in a wok or large skillet over medium-high heat. Add bell pepper, carrots, scallions, chili peppers, and garlic, and stir fry until the vegetables are soft, about 3 minutes. Add fish sauce, brown sugar, and soy sauce, stir fry until the sugar dissolves, about 30 seconds. Add noodles, sprouts, half the cilantro, and tofu. Toss gently to mix all the ingredients and coat everything with sauce and heated through, 2-3 minutes. Remove from heat to a serving bowl and sprinkle with remaining cilantro and peanuts. Serve either hot or at room temperature. I have a weakness for Asian dishes, and I’m always looking to learn new ones. Perhaps my all-time favorite Asian recipe is Pad Thai. I can’t get enough of this dish, but traditionally, made in Thai restaurants, the calorie count is measured in the billions. Having recently joined Weight Watchers, I now have to “skinny down” some of my faves. 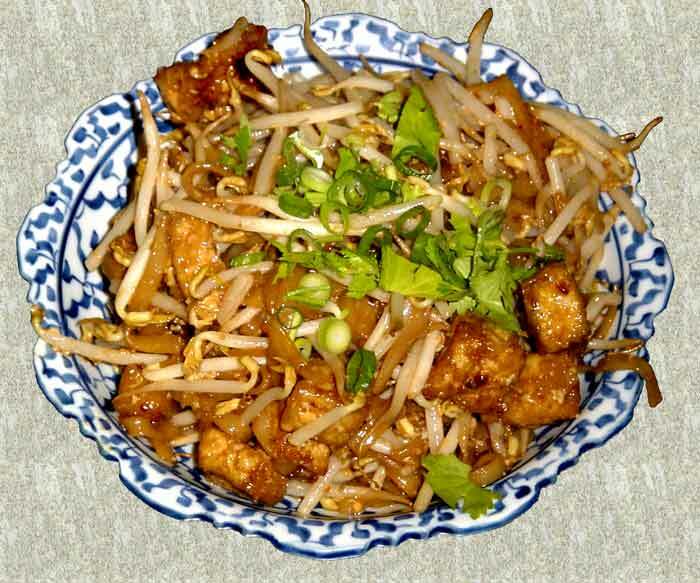 What I’ll present here is an absolutely wonderful rendering of this Thai favorite, but beaten into submission. This low calorie version has everything you could ask for in this dish, and yet has a much better PointsPlus value than traditional chicken Pad Thai recipes. It’s a great healthy meal idea to help satisfy your craving for Thai food, while still keeping you on track with Weight Watchers. 1. In a large bowl, soak rice noodles in warm water until they are limp and white, about 30 minutes. 2. Heat oil over high heat in a wok until very hot. Add the shallots and garlic and stir-fry until golden, about 10 seconds. 3. Add the egg and cook, stirring, until scrambled, about 30 seconds. Add chicken and stir-fry until mostly cooked through, about 5 minutes. 4. Drain the noodles and add to the wok, tossing with tongs until they soften and curl, about 1 minute. Add bean sprouts, cilantro, scallions, vinegar, fish sauce, sugar , salt and chile-garlic sauce; toss until the chicken is fully cooked and noodles are heated through, 1 to 2 minutes. Sprinkle with peanuts and serve immediately. We’ve been driving all day to the beach in Virginia. It’s hot down here — 100 degrees some places on the mainland, and a relatively cool 92 degrees out at the beach. It’s too hot to spend a lot of time slaving over a hot stove, and besides, kids are chomping for some beachy takeout. Because most of the takeout here consists of deep-fried seafoods, I figure we need to find another alternative on our first day at the beach. I’m sort of relieved to discover that there is only one Chinese takeout place in this quiet little beach village, and we’ve learned that it isn’t particularly good. But wait! I have another idea: How about if I whip up something yummy out of what we find here in town? The idea is met with some skepticism. Undaunted, I head out to the seafood market down the street from our little rental cottage to see what I can find, and what luck! Big, beautiful sea scallops, the size of ping-pong balls, which were brought in on a boat that day. Both kids really like scallops, which we often broil or sauté with browned butter, lemon juice and garlic. But the kids wanted Chinese, so I think I’ll give them what they want. I pick up a couple of Asian ingredients from the local market, a piece of fresh ginger and some scallions and voila! 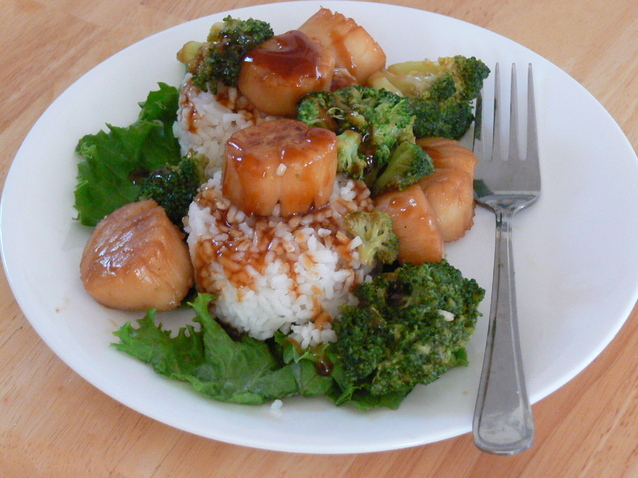 It’s a tasty, sweet and spicy Chinese takeout dish, General Tso’s scallops, made with fresh, locally caught sea scallops and some locally grown broccoli. Sea scallops are a tasty, different kind of seafood, and if you haven’t tried them, I highly recommend you do so. Mr. Bill’s Fresh Seafood on Harrisburg Pike carries some of the nicest, freshest sea scallops around, and the proprietor, Tim Glatfelter, or a member of the staff there will gladly provide you with some terrific tips and advice on cooking them in various delicious ways. You can also make this dish with shrimp, chicken or beef, but you need to try it. Combine scallops, 2 tablespoons rice wine, 2 teaspoons oyster sauce and 3 teaspoons cornstarch in a medium mixing bowl; toss to coat. Combine vinegar, sugar, chili-garlic sauce and remaining rice wine from the first 1/4-cup measure, oyster sauce and cornstarch in a separate bowl. Heat 2 teaspoons oil in a wok or large nonstick skillet over medium heat until smoking. Add half of the scallops and cook until browned, about 2 minutes per side; transfer to a warm plate. Add 1 teaspoon of oil to the skillet and repeat with remaining scallops. Wipe the skillet with paper towels and return to heat. Add remaining oil and the ginger and scallions and stir-fry until fragrant, about 30 seconds. Add the second 1/4 cup of wine and the broccoli florets to the skillet; reduce the heat to low, cover and simmer for 3 minutes. Add the cooked scallops and the ingredients from the second bowl back to the skillet and stir-fry, cooking and stirring constantly until the sauce thickens and the scallops are cooked through, about 2 minutes. Serve immediately beside a 1/2 cup of white steamed rice. And if you want to spice it up a bit, add two or three Asian dried red chilies just before you add the ginger and the scallions, and stir-fry them until they turn black, then proceed as directed. Have you ever tried to make your own duck sauce? Tired of those nasty little plastic packets you get at the take-out restaurant? Here’s a quick, easy solution: make your own. It’ll keep a while in the fridge, and I love making my own condiments. They’re so easy, and sooooo much better than the stuff you get at the store. Place fruit in a stock pot over medium high heat. Add water, apple juice, soy sauce, apricot preserves, brown sugar, garlic powder, and dry mustard. 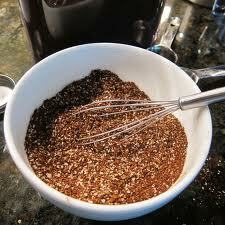 Bring to a simmer, stirring frequently to dissolve brown sugar. Reduce heat, and continue simmering for 40 minutes, or until fruit is completely soft. Remove from heat and allow to cool. Blend sauce in a food processor or blender until completely smooth, adjusting consistency with additional water, if desired. Cover, and refrigerate until ready to use. Cape Charles is a lovely little Chesapeake bayside seaport just a peace down the DelMarVa peninsula on Route 13 from Chincoteague, where we spend time whenever we have time to spend. Sting-Ray’s restaurant sits in an unlikely building on the northbound side of Route 13 about a mile south of SR184. It looks like a souvenier joint and gas station, which it is. But it is also a terrific pottery store, and the restaurant inside has been written up in all the southern-living-type magazines. It is a true find. But since you’re likely not to get there any time soon, I thought I’d give you a little taste of heaven from this heavenly little surprise. And thanks to my friends Lisa and Tony for reminding me just how wonderful this little dish can be. Lisa, you make it this way, and I guarantee you Tony will love it. And Tony, if you don’t love it, you need your taste buds examined. 1. Heat oven to 400°. Heat 5 tbsp. butter in a 2-qt. saucepan over medium-high heat. Add flour, and cook, stirring, until smooth, about 2 minutes. Whisk in cream, and bring to a boil; reduce heat to medium, and cook, stirring, until thickened, about 10 minutes. 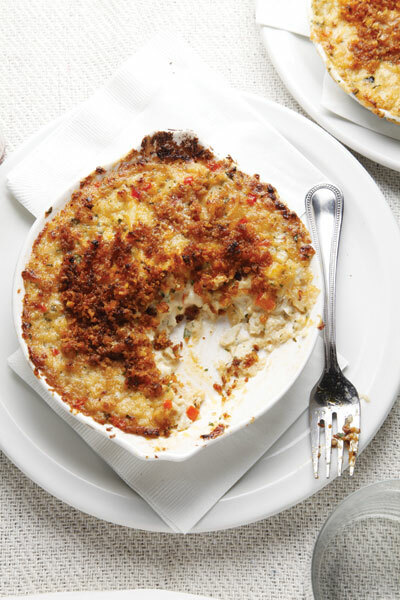 Remove from heat and stir in crabmeat, half the bread crumbs, bell pepper, onion, half the parsley, sherry, juice, Worcestershire, half the paprika, mustard, cayenne, and salt and pepper. Divide mixture evenly among 6 shallow 6-oz. ramekins; place ramekins on a baking sheet and set aside. 2. In a small bowl, mix remaining butter, bread crumbs, and paprika until evenly combined; sprinkle seasoned bread crumbs evenly over each ramekin. Bake until lightly browned and bubbling in the center, about 20 minutes. Sprinkle with remaining parsley and serve hot with toast on the side. Toss all the produce ingredients together in a large bowl. Mix the remaining ingredients to make up the sauce and adjust the sugar and vinegar to your personal preference. Serve the cole slaw dry in a salad bowl, and the dressing on the side with a ladle (or, if you must, mix the dressing with the produce and toss well. Just don’t use too much dressing. 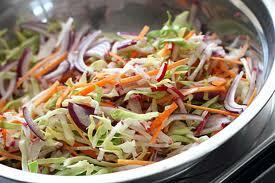 This cole slaw recipe is meant to be served on the dry side. Salt and Vinegar Smashed Red Potatoes — Yum! In a medium pot, bring potatoes to a boil, in salted water. Reduce heat and cook at a rapid simmer until the potatoes are tender, about 20 minutes. Drain, then place the potatoes between a dish towel and gently smash the potatoes until they are flattened, but still in one piece. Place on a baking sheet that has been sprayed with olive oil. Brush the tops of the potatoes with oil, sprinkle with salt and place in an oven preheated to 450 degrees, and bake, flipping once, until they are crisp and golden on top, about 30 minutes. 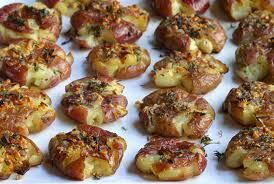 Remove from oven, toss with vinegar, sprinkle with salt, and garnish with fresh chopped parsley. Serve immediately. I am married to the World’s Greatest Mom. I know this because she has a coffee mug that says so. Her daughters continue to reaffirm this fact every year at Mother’s Day by presenting her with more awards that proclaim her World’s Greatest Mom. Therefore, it must be so. I know that most of you think that you are somehow related to the real World’s Greatest Mom, and I expect that your mom has the hardware to prove it, too. Today is Mother’s Day. It is, in my opinion, one of the two most important nonreligious holidays of the year (the other being Thanksgiving). This is a day we take time out from our otherwise hectic schedules to recognize the most important person in our lives — the person who is expected (fairly or not) to keep the house clean and laundry done, buy the food and clothing, make sure there are tissues and toilet paper in all the right places, know which school days are early dismissal and in-service, and generally hold things together — and to do it all with good humor and a smile. Personally, I don’t think one day is enough. To borrow a marketing phrase, Mom does more before 9 a.m. than most people do all day. She deserves, every single day, the attention we bestow on her on Mother’s Day. In my experience, all she does is taken for granted almost as much as eating or breathing. This shouldn’t be; we should all be giving Mom special treatment every day, because that’s what she gives us. That said, we are taking care on Mother’s Day to do something special for her, something we don’t do every day. Chocolate? Nice, but gone in 24 hours. Flowers? Sure, but they last a few days, then die. Our girls are working on a special homemade gift, one that Mom is sure to love. Homemade is so much better than something purchased from a shelf loaded with dozens of “that special gift” Mom will cherish for a day or two. And I’m cooking (of course! ), something from the garden, but altered slightly to be healthy, to fit our current lifestyle of lower cholesterol, lower blood pressure, lower calorie. I’m making a frittata, and the surprising ingredient, one that I found growing in our garden when we moved here nine years ago, is asparagus. 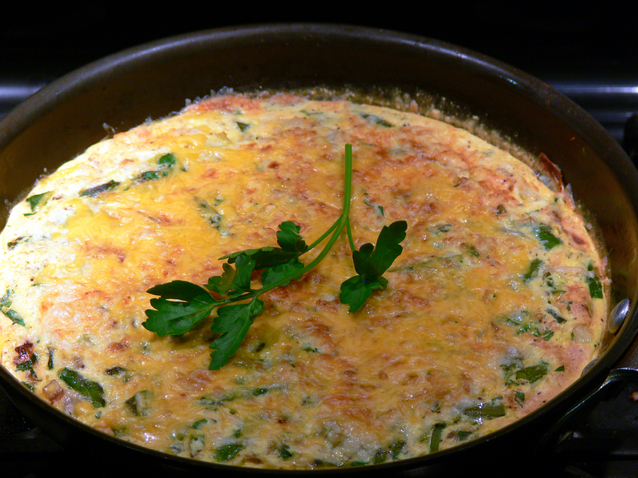 Last year I gave you a yummy Asian-inspired asparagus soup, and now I present an equally delicious asparagus frittata. You can serve this for breakfast — it’s quick, easy and beautifully presentable, and it’s nutritious as can be — or you can serve it as a complete dinner. We call it “breakfast for dinner,” which we do every couple of weeks. Serve it with smashed, roasted, salt-and-vinegar red potatoes, the recipe for which I will place on my blog, TalkingFresh.typepad.com, along with another frittata recipe that’s worth a look. And do it for Mom. In a small saucepan, bring water to a boil. Add asparagus, cover and boil for 3 minutes. Drain and immediately place asparagus in ice water; drain and pat dry. In a 10-inch ovenproof skillet, sauté onion in oil until tender. Add parsley and asparagus; toss to coat. In a small bowl, combine the egg substitute, 3 tablespoons Parmesan cheese, salt and pepper. Pour over the asparagus mixture; cover and cook over medium heat for 8-10 minutes or until eggs are nearly set. Sprinkle with remaining Parmesan. Place uncovered skillet in the broiler, 6 inches from the heat, for 2 minutes or until eggs are set. Sprinkle with cheddar cheese. Cut into quarters. Serve immediately.